Looking forward to the feedback from those of you installing these. Hi Mirko...I got mine in the mail today! Thanks much. Unfortunately I wont be much help as I don't have a reason to take the engine down yet. But when I do it'll be going in. Sorry for stupid question...but this uses the stock tension adjuster yes? yep u need to use stock or u can use that aftermarket manual. ...What I found also is that spring in adjuster is sometimes weaken by age. What I always do is I apply more force to adjuster with small rod/screwdriver from behind the adjuster... But I don't over force it! Thats important because to much force will over-tighten the chain. U can buy those chains in already riveted state. But shops around the internet does not now the difference. About cam chains. Earlier thread were old good Tsubaki Camellia, Yamiya(DID 219FTS) and DID 219FTH (open chain) are discussed. Messner, love the work as always and am very tempted to buy some of your goodies! cyclex chain will not work because it has 94 links. You need HD chain with 96 links. Where can you get the endless 96 link chain Mirko?? I couldn't find any. I have a factory KTM tool on its way to me right now. Some KTM's require an open cam chain. Tool looks to do a great job but it isn't cheap. Well....I received the KTM cam chain tool today. It is really nice. 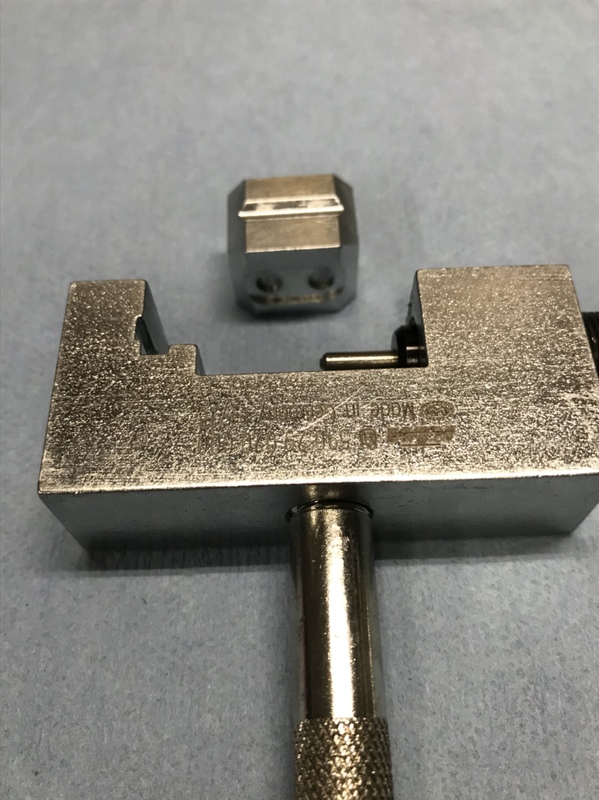 There is a 2 face sliding block.....1 face sets the side plate to the proper depth while the other face puts a factory peen on the pins. Mint. 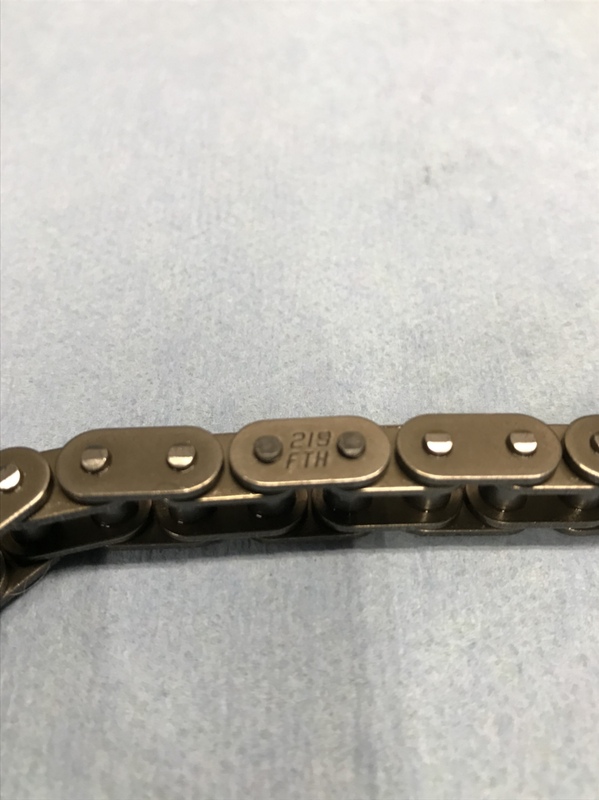 Just riveted 2 chains. Didn't like the first one....my fault. Learning curve was steep and the second one is perfect. Great tool. Will redo the first one....master links are cheap. Just some info. I got ome cam chain links from nimbus9020 on ebay. They are for DID. I got 3 hard nose and 1 soft, hollow point nose. The soft nose is an 219 FTS. The hard are 218 FTH. I think the H mean hard and the S means soft....keep in mind I am just guessing. They look exactly alike. I think the soft, hollow nose would be better suited for most guys (easier to expand with normal tools). The ebay fella is very good based on my experience. DID 219FTH and DID 219FTS are two different chains. They are similar but there are some differences in properties. 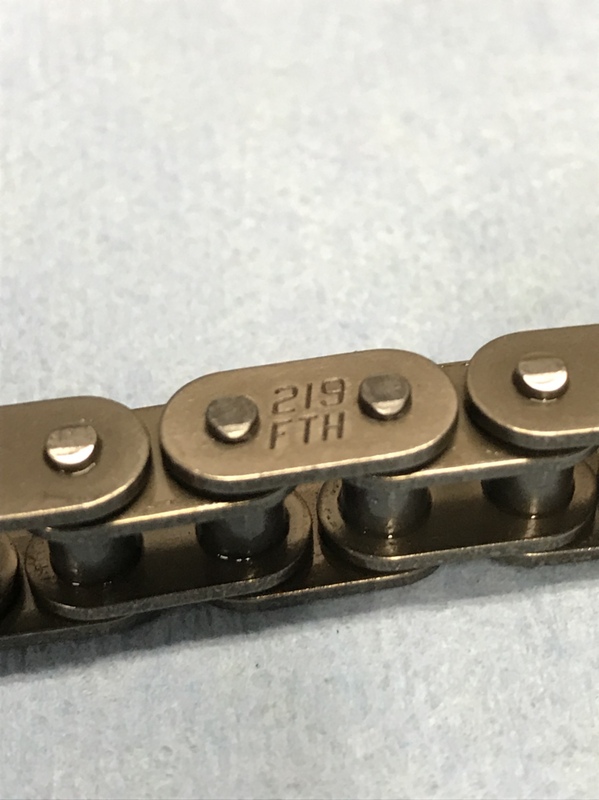 FTS chain is little bit weaker but main difference is PIN diameter.... it is only for 0.01mm but there is a difference. 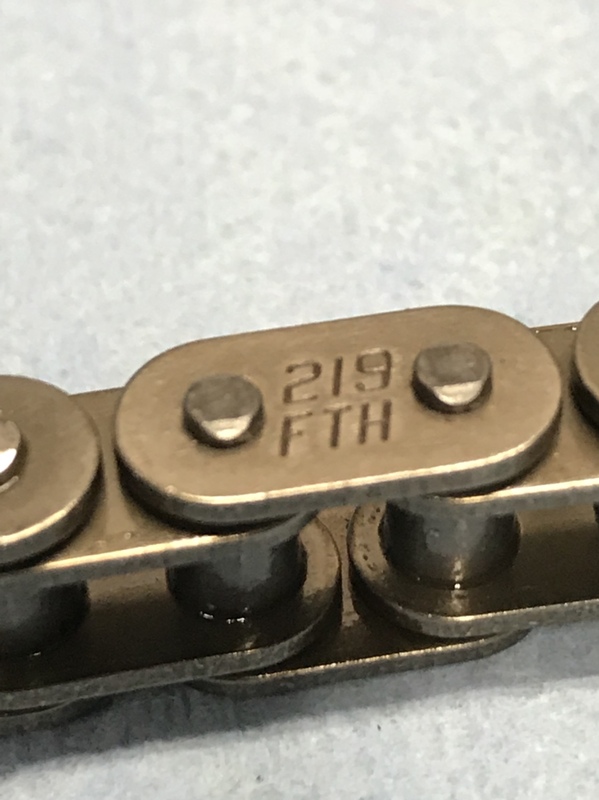 I would not mix fth chain with fts link ? Maybe I am wrong? Where are there installation instructions....trying to install one now. I can write one but basically it is a copy past of OEM tensioner installation. It goes completely the same. I can assist you over the phone, skype etc. Just PM me your contact and when to call you. Sorry to here that. Probably there is a difference between OEM cylinders chain tunnel? I did all according to OEM cylinders and test fitted only with several OEM cylinders. The billet block has identical dimensions for the cam tunnel. The problem we were having was when the two lower pins were in the tensioner there was no way to get the top pin in. The posititon where we could get the pin in made it impossible to slide it over into the correct slot where the pin should sit. Also when we put the two 1 piece pins in and left the 3 piece pin out there was no way to get the 3 piece pin in later because the O.D of the sleeves were too big to get the pin through the roller. I don't think it would be possible to get the 3 piece pin in later with any other setup besides stock sleeves or at least stock sleeve OD. We also had the base gasket rubber banded the the block so we wouldn't make a mess of the copper gasket spray. My theory was that the 0.040 base gasket made the block too tall to get that top pin in but honestly it seemed more far off than that extra 0.040 would give.Also doesn't that 3 piece pin sit under the base gasket? Hopefully my explanation of the problem was clear enough and please do feel free to chime in. The bottom end is already sealed up with the 96 link DID 219 FTH so I'd really like to make this tensioner work. Sorry if my explanation wasn't the clearest. We tried installing the tensioner several different ways i'll explain the problems we ran into with each way. 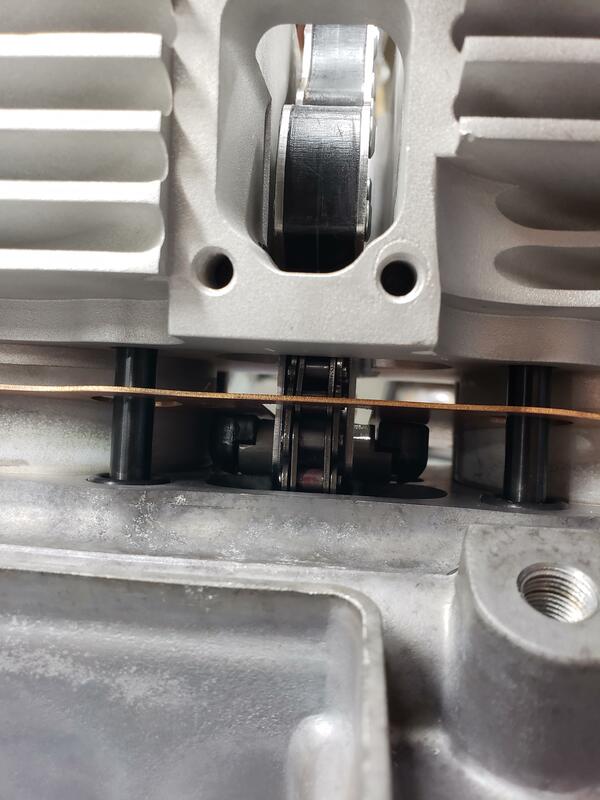 We ruled out cutting away part of the gasket to clear the 3 piece pin because the gasket is the only thing holding that 3 piece pin in place and even if we removed just enough to get the metal section to clear the gasket we would really sacrifice stability in that part. Scenario 1: Putting the 3 piece pin in first. When doing this you can't raise the cradle side of the tensioner high enough to get the top pin in because the 3 piece pin hits the bottom of the block first. Scenario 2: We tried putting the top pin in first but after doing so we realized there was no way to get that 3 piece pin in afterwards because the large OD of the sleeves mad less room between cylinders 2 and 3 making it impossible to slide the 3 piece pin afterwards. 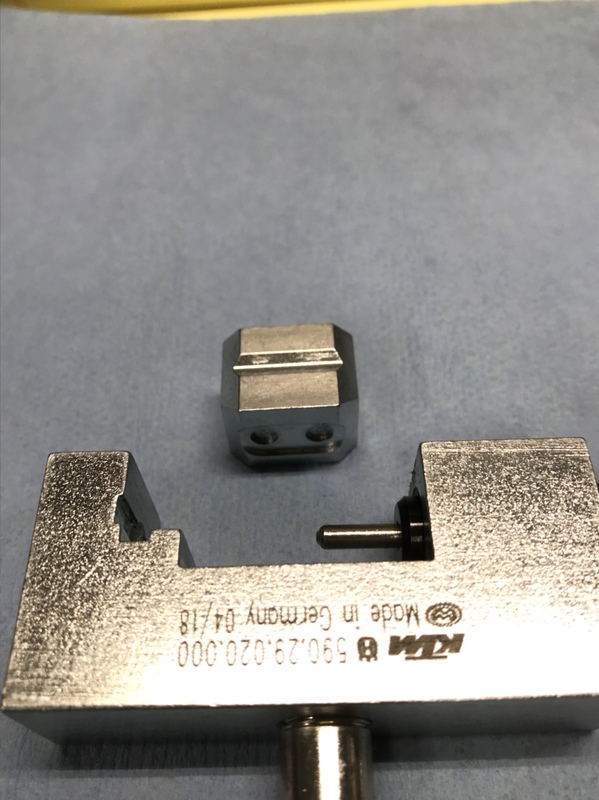 We contemplated removing material near where the top pin sits in the block, just enough to get to slide the pin into place but we'd still have to really tweak that base gasket to get that bottom pin in as the 3 piece pin would still be holding the gasket against the block. 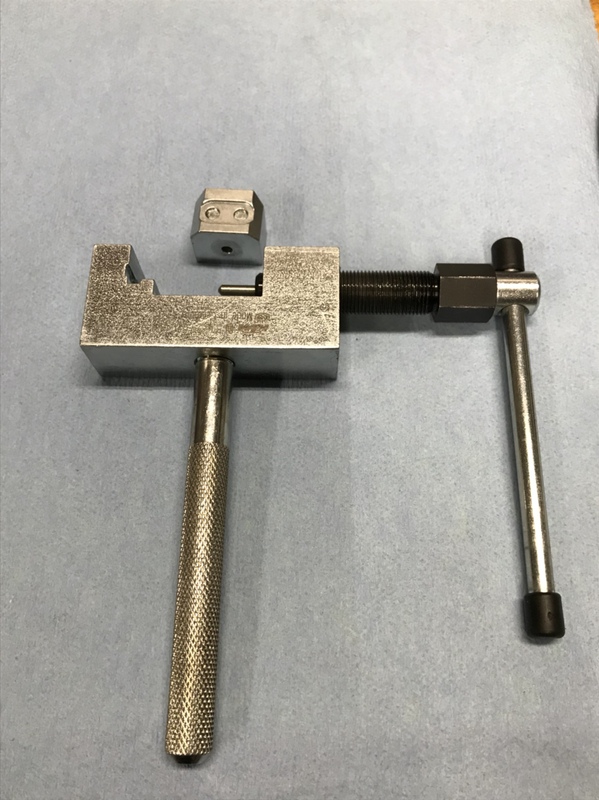 The only way for this tensioner to work with something with a larger sleeve OD over stock would be be to make the top hole in the tensioner a slot that allows some up and down play. will shortening the roller pin for 2mm per side help? By my calculations this would be enough to slide the pin in and there is plenty of contact with lower case and roller pin left. But you would need to confirm this. The other solution that comes to my mind is to unrivet the chain and rivet it after tensioner instalation. Folks, I've completed recently a track day and a full race with Messner camchain tensioner, everything's good!